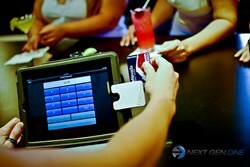 Next Gen Dine by Prelag Partners LLC now offers merchants a leasing option for point of sale hardware. Next Gen Dine restaurant point of sale by Prelag Partners LLC now offers merchants different hardware purchasing options. Next Gen Dine offers leasing options for purchasing equipment. Merchants who want to run on Next Gen Dine now have the option to lease or purchase equipment from the website. Merchants can purchase or lease Next Gen Dine bundles. Other items such as cash drawers stand and printers are also available for sale. Next Gen Dine is the future of restaurant dining. For more information about leasing or to find out how your restaurant can take part of Next Gen Dine, contact Paul Roberts, Managing Partner, at 1-877-342-2218 or paul(at)nextgendine(dot)com. Connect with us on Twitter, Facebook and LinkedIn.